MOTIVATION for READING: I enjoy reading the source material for movies and I have seen this on so many ‘best of’ and favorites lists. 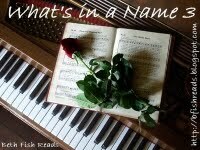 So I bookmooched it – then decided it would be PERFECT for the Royal Title category of the What’s In a Name 3 Challenge. WHAT’s it ABOUT: A kid is read this story so you will not only have the adventure of what happens to the Princess who is supposed to wed the evil royal dude but you have the whole “how it came to be that this story is read to the kid” story, too. It’s cute, well done. I think the movie has a Grandpa reading the story but the book has much more on the why and how Goldman came to publish this abridged version from the ‘original’ author and how his Dad was the guy who read it to him when he was but a youngster. The movie remains a big favorite and I do want to say that casting was excellent. But isn’t that the issue with reading the book after seeing the movie? I imagined Cary Elwes as the Man in Black, and of course the Fezzik in the book sounded and looked like he did in the movie and Mandy Patinkin was SO the Spaniard! Right? Am I right? Tell me if I’m wrong. FINAL THOUGHTS: When it comes to the genre of fantasy fairy tale, I’m wondering if I just don’t have a very good imagination. I’m reminded of Neil Gaiman’s Stardust – another that I liked the movie much more than the book. I’m rating this THREE PIE but a very strong THREE PIE – I liked it. and I liked the movie better. Imagination is hard for me when it’s a new-to-me fantasy book, I’m constantly second-guessing how people and places should look. I read the book years ago, but I’ve only ever seen bits of the movie. Which is further proof that I’m not much of a movie person, since I’m ignoring a cult classic. Stardust and The Princess Bride are two (of only a very few) movies I like a whole lot better than the books they were based on. I never know if it’s because I saw the films first, or just because the books aren’t that good and the movies are superb. It’s rare that I like the movie better than the book, but it does happen. I haven’t read the book or seen the movie, but it sounds like I need to look for the movie. This book is on my list, though I’m a bit tempted to simply watch the movie instead. I’ve read the book two or three times. I’ve seen the movie two or three DOZEN times – it’s an all-time favorite. I think the fact that William Goldman also wrote the screenplay makes it one of the better book-to-movie adaptations, but I’ll always pick the movie over the book with TPB. Of course, you’re right! Being wrong would be inconceivable. I enjoyed the movie – I’ve only watched it once, though. It’s probably time for a re-watch! I love the movie too and I don’t think I would ever want to read the book. I don’t want to spoil the images I have of all the people and the places. I read the book first and so had to be dragged kicking and screaming to the movie (just like for the movie of To Kill a Mockingbird). How could the movie possibly measure up to a book that has things like the “reunion scene” in it? Remember? Where Westley and Buttercup are finally reunited when he’s fallen down the hill yelling “As You Wish” and then she falls down the hill and they’re together and…the book stops, and the author says you can send away for the reunion scene (I did, and got a very funny two pages of why he couldn’t write it yet). I love the book-within-a-book. So the movie tries to do that, but it’s not funny, just sentimental. Despite, that, though, I like the movie because, as you say, Mandy Patinkin is so totally Inigo Montoya. And Chris Sarandon is great as the pretty face. The Eyre Affair, of course. Barbara Kingsolver’s new The Lacuna (although I’m finding it so sleep-inducing I haven’t finished it) and her older The Poisonwood Bible. Hmm. Seems like there should be some other immediately obvious ones. Guess now this is going to bug me all day! sorry! I do want to read The Eyre Affair but need to (re)read Jane Eyre FIRST. I don’t have that recollection for The Poisonwood Bible -except maybe the title? but it’s not unlike me to not remember stuff about novels, even books I say are more favorite. I’ve seen the movie a lot of times but never read the book. I might just keep it that way.